Among the 21 states that experienced an #HCBS waiver waiting list increase from 2015 to 2016, the average increase was lower in #Medicaid expansion states compared to non-expansion states. Figure 1: Average Medicaid HCBS waiver waiting list increase from 2015 to 2016, by ACA expansion status. 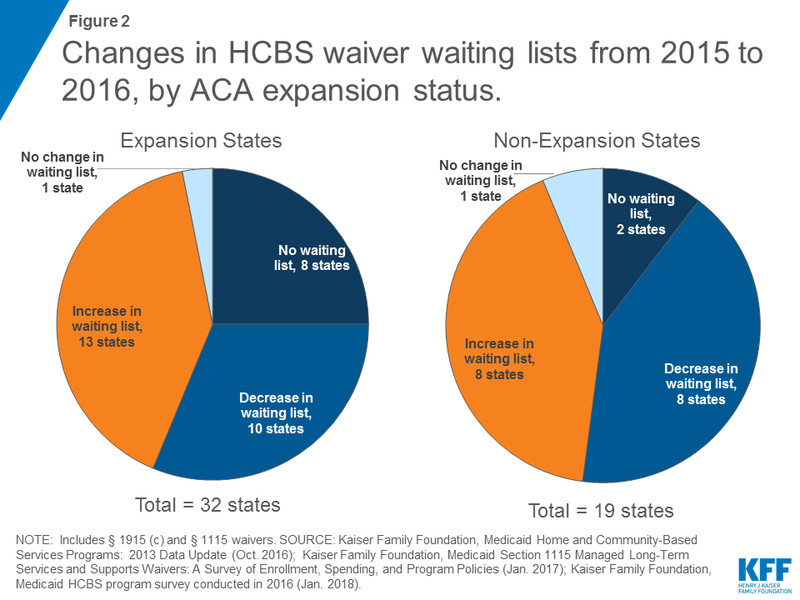 Figure 2: Changes in HCBS waiver waiting lists from 2015 to 2016, by ACA expansion status. 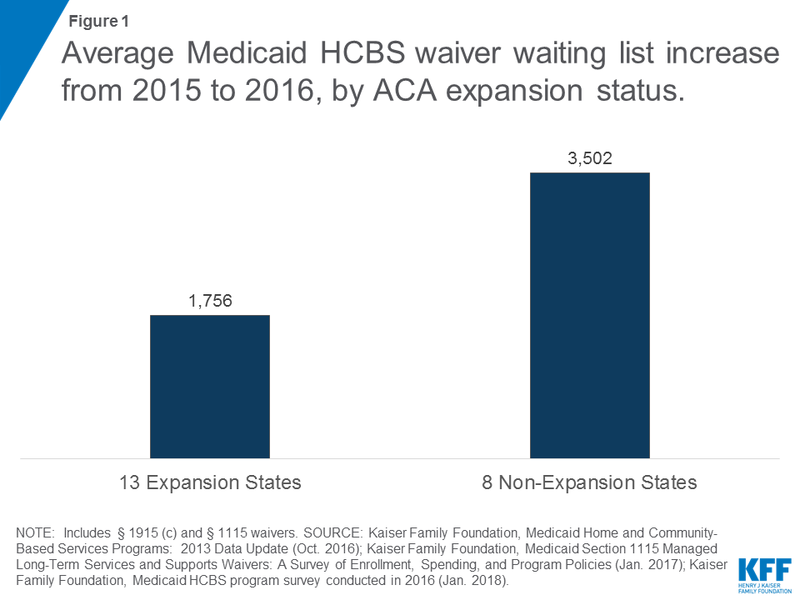 Medicaid HCBS waiver waiting lists pre-date the ACA’s Medicaid expansion, which became effective in most states in 2014.6 Over 656,000 people in 39 states were on HCBS waiver waiting lists in 2016 (Figure 3); 35% of total HCBS waiver waiting list enrollment (232,000 people) are in Texas, a non-expansion state. Not all people on waiting lists may be eligible for Medicaid waiver coverage, as many states do not determine eligibility until a waiver slot becomes available. As of 2016, just over half (53%) of waivers with waiting lists screened individuals for eligibility before being placed or while on a waiting list. However, most people on HCBS waiver waiting lists are receiving other Medicaid services. Nearly 90 percent of waivers with waiting lists provided non-waiver services (i.e., Medicaid state plan services, such as personal care) to people who were waiting for waiver services. 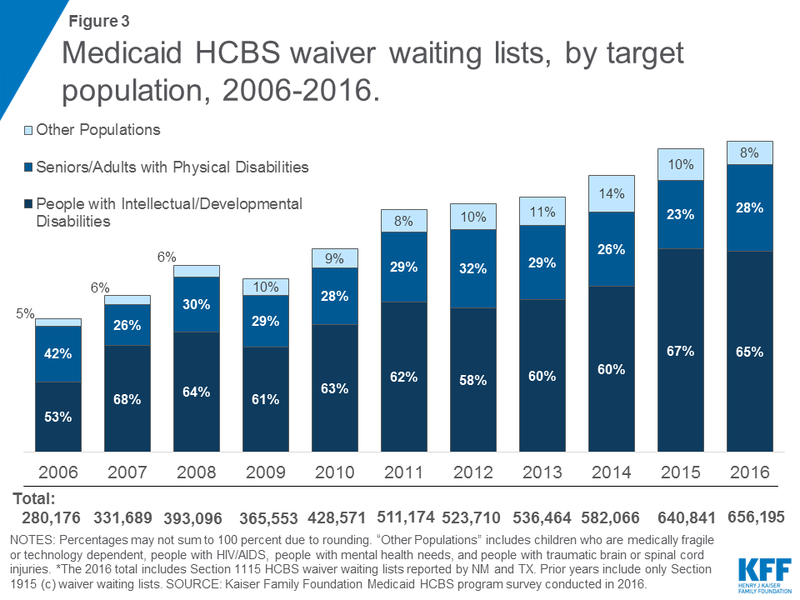 Figure 3: Medicaid HCBS waiver waiting lists, by target population, 2006-2016. NOTES: Data may not sum to total due to rounding. I/DD – Intellectual/Developmental Disability; TBI/SCI – Traumatic Brain Injury/Spinal Cord Injury. “Unknown” indicates there was a waiting list but number of persons is unknown. A dash indicates that there was no operational § 1915(c) waiver for the target enrollment group or waiting list. AZ, RI, and VT do not have § 1915(c) waivers but provide similar HCBS in §1115. *NM and TX reported waiting lists for seniors/physical disabilities in their §1115 waivers. SOURCE: KFF analysis of Medicaid HCBS Program survey. New York is categorized as “no change” because it reports a waiver waiting list but did not report the number of individuals on the waiting list in 2015 or 2016. For purposes of this analysis, Maine is considered a non-expansion state because it has not yet implemented the expansion. Most expansion states have opted to “align” their expansion adult benefit package with their traditional state plan benefit package, by offering all state plan services to expansion adults if medically necessary. Previous analysis shows that nearly six in 10 (57%) nonelderly Medicaid adults have a disability but do not receive federal Supplemental Security Income (SSI) cash assistance benefits, meaning that they are eligible for Medicaid through another pathway, such as the Medicaid expansion in states that have adopted that pathway. Indiana implemented expansion in 2015. Medicaid expansion coverage became effective on January 1, 2014 in 25 states. Two states implemented in 2014 (Michigan, April 1, 2014; and New Hampshire, August 15, 2014). Three states implemented in 2015 (Pennsylvania, January 1, 2015; Indiana, February 1, 2015; and Alaska, September 1, 2015). Two states implemented in 2016 (Montana, January 1, 2016; and Louisiana, July 1, 2016). Maine has adopted but not yet implemented expansion.